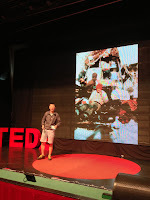 Last year I had the honor of speaking at the first TEDxVictoriaHarbour, and trying my damnedest to throw some inspirational messages out there. I'm not sure at all that my feeble attempt met with any success, but I'm real happy to have been part of the event. One year later, I have moved myself back to Hong Kong, and naturally found myself supporting the event in its second year. I decided to go with a couple of friends and collectively take in the inspirational messages. I'm not exaggerating when I say that I had been looking forward to this for the last 2 months, waiting for this day to arrive. 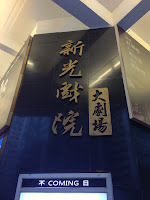 The venue this year was the Sunbeam Theatre (新光戲院大劇場), a theater with a 40-year history famed for being one of the last performance venues for Cantonese opera. The place has faced multiple threats of closure within the last 10 years, but has received a temporary reprieve until 2016. 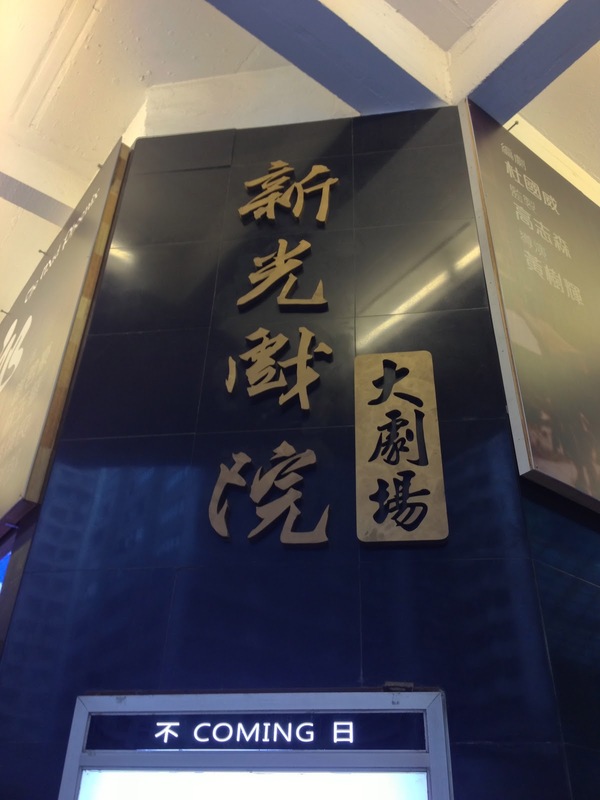 It's my first visit to the theater, and I'm glad that there are efforts from the community to preserve a part of Hong Kong's cultural history. The theme this year was "E-Motions in Travel and Tourism", and an interesting roster of speakers came up one by one to talk about their personal experiences, to try to inspire us to do better. My memory is a little hazy in my old age, but I don't recall watching pre-recorded segments at the event last year. This year there were a few of them, but they certainly were inspirational. We started off with the recording of Barry Schwartz's talk on "The Paradox of Choice", which is a segment I had watched before and found very illuminating and thought-provoking. Dean Head then took the stage, talking about his work shooting films in and around Hong Kong, and how using one's city/country as the location of films can promote tourism and bring in revenues. I guess the underlying message is a plea for the Hong Kong government to make it easier for filmmakers to do their work here, as it will eventually end up benefiting the city as a whole. Tom Schmidt got up to talk about his early days of backpacking through different countries, and how he used to pass the time by drawing in a sketch book and writing snippets about the people he comes across, his thoughts about certain destinations, events which took place during each day…etc. (How I wish I had the talent to draw like he does…) He spoke about how spending time drawing on his travels enabled him to interact with the locals on a very personal level. He put together books about his travels to give out to friends and relatives, including a "fake" order form in the back. He was surprised when he started getting actual orders from people around the world… His final message? "See the world before you leave it". Next up is Tyson Wheatley, who moved to Hong Kong from Atlanta with CNN. He discovered Instagram and quickly became an addict, founding HK InstaYay to get together with other Instagram users for interesting pics. He spoke about how picture taking and sharing has fundamentally changed nowadays, and introduced the notion that "everyone is a photographer". While it seems like a no-brainer as I look at the people around me, it's still a poignant message. He recounted how, on a trip back to Atlanta, he chose to spend time with complete strangers (to take more Instagram pictures) instead of spending quality time with people he knew and loved. Finally he announced that he had contacted Instagram about getting a job, and much to his delight, he will be relocating to California to run Communications for the firm. So here's a case where a passion (or was it addiction?) for something has actually turned into a job. Pretty cool, eh? We were shown the pre-recorded talk by Ric Elias, one of the passengers on Useless Air Flight 1549 that crashed landed in the Hudson River. Here's a man who came face to face with death, and things that were truly important became crystal clear to him. In his short but powerful talk, a number of quotes really stood out to me: "I no longer wanted to postpone anything in life", "I regretted the time that I wasted on things that did not matter with people who mattered", "I decided to eliminate negative energy from my life", "I no longer choose to be right. I choose to be happy". After having been given a second chance in life, he realized that his "only goal in life is to be a great dad". 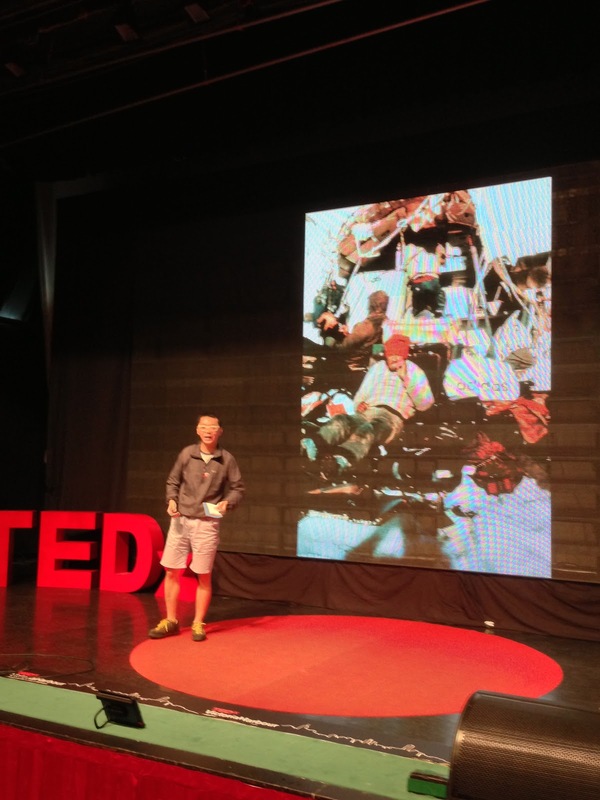 He challenged the audience to think about how they would change their lives if they were faced with the same situation. I must say I found this to be incredibly inspirational on a personal level. Jim Spear, the hotelier behind The Schoolhouse at Mutianyu, spoke about his experience with interns at his hospitality business. Interesting to see the passion and ideas from interns coming from as far as the Ivory Coast. I met up with Andrea Oschetti, a fellow speaker from last year, at the reception before the event kicked off. He was very nervous, as he was cooking the sauce for tonight's dinner this morning… and couldn't remember whether he had turned off the heat before coming over to the theater! He had to send someone to check on it… and fortunately all was well. Andrea the traveling chef spoke about researching for his trip to Patagonia and following the footsteps of Magellan and Darwin. Is it any surprise that he talked with his hands, like so many other Italians? Not to me… He ended his talk by telling us that, at the end of his trip, he and his wife went off the trail and wrote their own pages in their travel books. Very interesting message. We then had a musical segment from Erica Yebyeol Lee, the barefoot violinist. Showing us a little bit of nervousness, she announced that she's been on stage performing for years but she's never actually had to speak… She's composed a musical piece to express the fear of flying, and I thought the violin was the perfect instrument for musicians to stir up emotions in the audience. It's hard to miss Bobsy Gaia - who runs Life Cafe, MANA! Fast Slow Food and other establishments - since you're likely to see his hairdo from a mile away. Bobsy asked us to think of the Earth as our home - which it is, really - and therefore treat it with respect. He also made statements like "the Earth is not dying, it is being killed"… which, in all honesty, isn't far from the truth. He proceeded to show us a collection of statements - some of which are fairly controversial - and asked us to consider them without judging. He's spreading a pretty interesting message, and one that I largely agree with when it comes to being eco-friendly. The last pre-recorded segment featured Elora Hardy, who spoke of her childhood growing up in Bali and designing her own house at the age of 9… and having it built. After a career in fashion, she's now back in Bali, designing and building sustainable housing made entirely of bamboo. I found it interesting that she spoke with a rather squeaky voice… and then in the middle of the video the pitch went higher… and then we were listening to a chipmunk on the screen. The audience burst out in laughter at the realization that there has been a technical glitch, and the playback speed was wrong. After it was corrected, Elora suddenly sounded a lot more normal… Anyway, it's really amazing to see the beautiful work being done by Elora and her team in Bali, and truly inspirational for people to take away the message to "get up and take a stand". Armed with no background in architecture, engineering or business, she has dared to dream big and set out to achieve her goals. Bravo! The second photographer of the day was Simon Wan, who actually is a professional photog. He spoke about the importance of amateur photojournalists, who are important "because the pros usually arrive too late". We were shown an amateur photograph, taken by one of the surviving members of the 1972 plane crash involving the Uruguayan rugby team (famously made into a Hollywood movie called Alive). The picture showed one of the survivors eating the flesh of their dead fellow passengers - something they had decided to do in order to survive in a terrain with no food. I know of the story but had never seen the picture until now. I guess it was a little before my time… He ended his segment by taking out his large format view camera and taking a picture of the audience - asking us to hold still for 30 seconds. This has been an incredible day full of inspiration for me. Many thanks to the organizers who generously allocated me a ticket. I'm looking forward to attending again in the future! P.S. A final shout out to Harbour City who, as one of the sponsors, generously included a Rubber Duck Project postcard with every "passport" handed out to attendees. Yay!